Menorca Airport parking provides to passengers the best service at the most competitive prices. 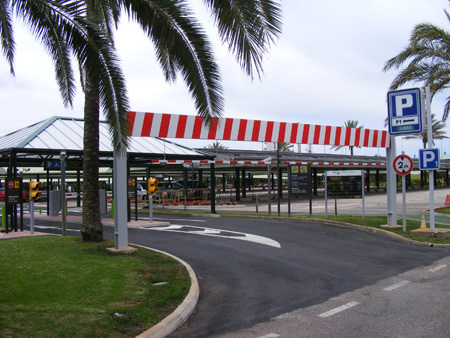 Passengers parking at Menorca Airport have a choice of two parking areas depending on the duration of their stay. The short-term parking know as P1, is the best option for those stays of less than 4 days; on the other hand, the long-stay car park at Menorca Airport is the perfect option for longer stays, and is known as P2. There is another parking for hired cars. If you want to rent a car, see the menorca airport car hire options here. Menorca Airport parking lots are located directly outside the main terminal building, within a quick walking distance to the building and all airport facilities. The short-stay car park, also known as General Car Park P1, has 690 spaces for private vehicles available. It is located just in front of the main terminal building. - 1st minute: € 0,426992. - Minute 2 to 30: € 0,014724 / min. - From minute 31: € 0,027652 / min. - € 11.50 (low season). - € 9.10 (low season). High season: From April 1 to Oct. 31. Low season: From Nov. 1 to March 31. The long-stay car park at Minorca Airport, also known as General Car Park P2, is located near the terminal, and has a capacity for 464 vehicles. The long term parking is the best option to these passengers that leave the car at the airport for more than four days. - € 11.20 (low season). The price for the first four days is the same in the two parks. First 15 minutes are for free. For the first minute: € 1.0450. For those passengers or tourists, driving and parking their own vehicles at Menorca Airport will be easy. There is a road to access to the airport called Me-12, that connects with the main road of the Island, called Me-1, that connects Ciutadella and Mahon. Anyway, the roads are well indicated and arrive to airport should be easy.